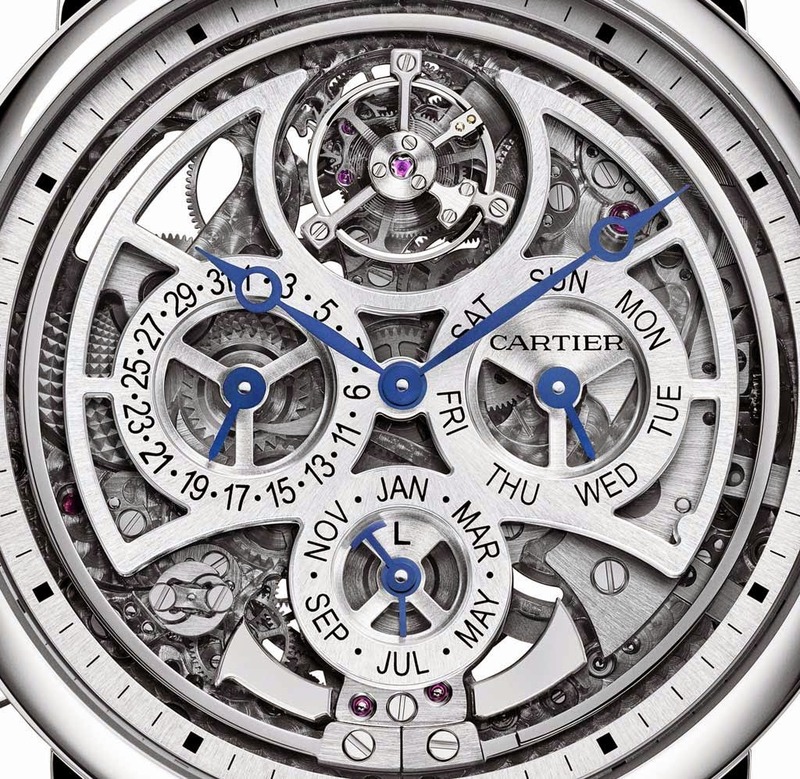 Combining the mechanisms of a minute repeater, a perpetual calendar and a flying tourbillon, the Rotonde de Cartier Grande Complication Skeleton watch is nothing less than the most complicated watch ever created by Cartier. A few figures give the idea of the challenge represented by this watch: 578 components, 5 years of development, 15 weeks of production at the Manufacture, 10 weeks of decorating and finishing and 5 weeks of assembly. This "Poinçon de Genève"-certified timepiece combines the elegance of a 45 mm platinum case with a self-winding and extra-flat skeleton movement (just 5.49 mm thick). 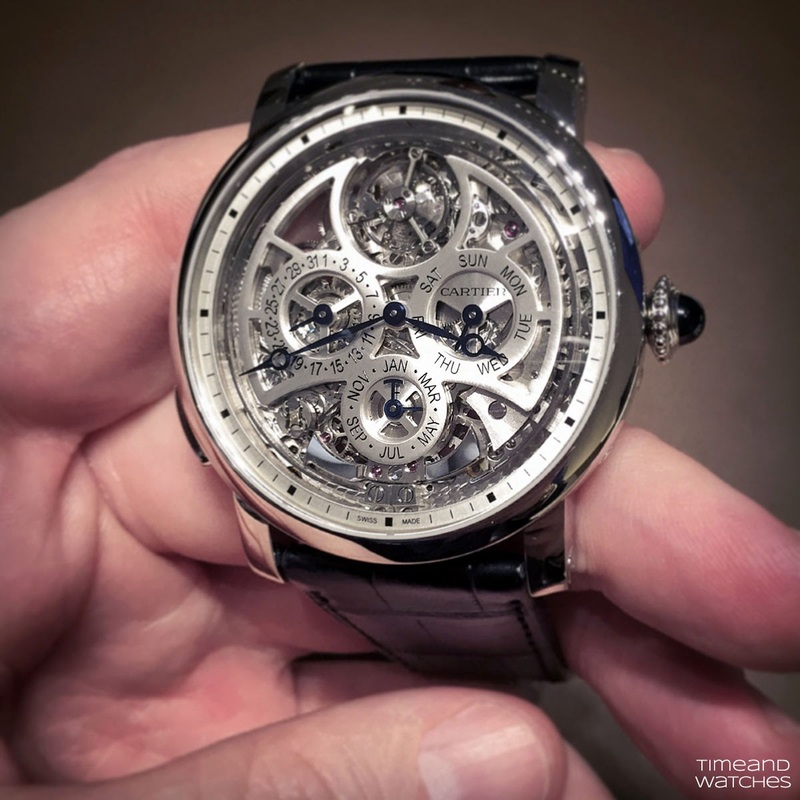 Enabling the wearer to hear the time on demand, the minute repeater function of the Rotonde de Cartier Grande Complication Skeleton is prominently displayed on the dial, with gongs and hammers in full view. Rather than a slide, the watch uses a push-button to activate the minute repetition. A specific “all or nothing” mechanism prevents the possibility of a partial activation of the minute repeater, thus avoiding an inaccurate acoustic indication of the time. 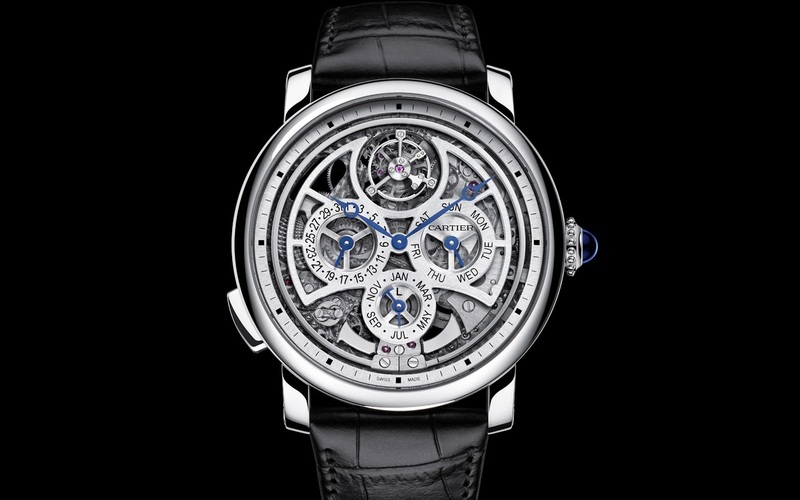 Located at 12 o’clock, the flying tourbillon on the Rotonde de Cartier Grande Complication watch boasts an ultra-light titanium carriage and is characterised by the complete absence of the upper bridge, which enhances the aesthetic result. The perpetual calendar indicates the date, automatically recognising not only whether a month has 30 or 31 days, but also the month of February - even in leap years, which occur once every four years. 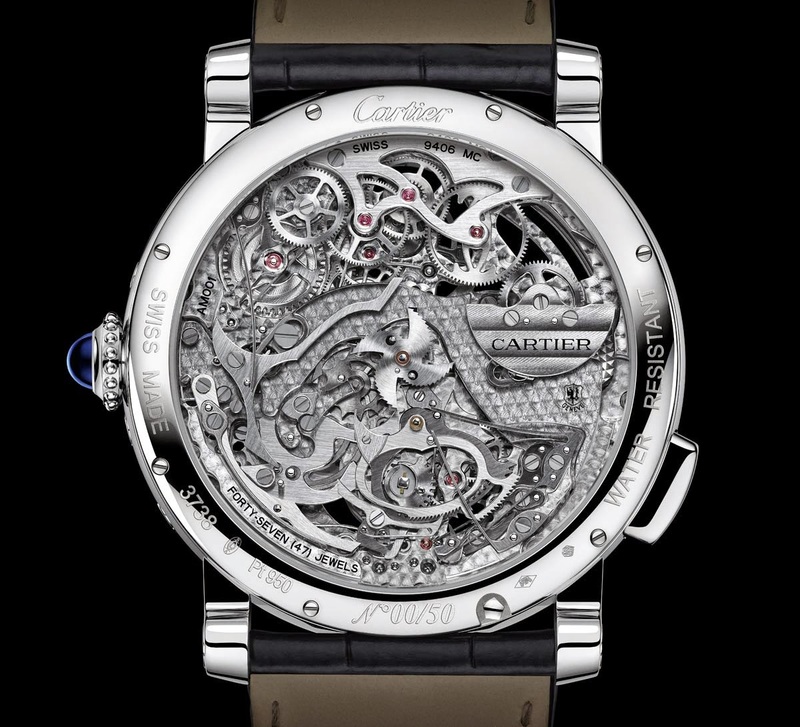 The Rotonde de Cartier Grande Complication watch only needs adjusting once every 100 years. 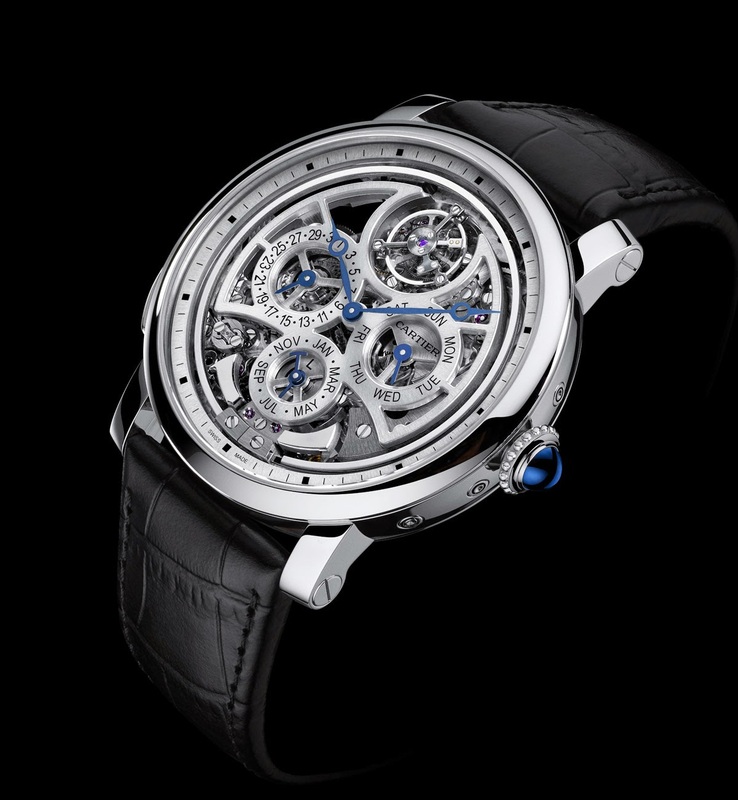 The calibre 9406 MC gets its energy from a platinum micro-rotor with “guilloché” and “Côtes de Genève” finishing. The innovative construction of this two-level micro-rotor enables a reduction in winding speed while limiting energy loss.